This is a history of the humans in these struggles--the hominid and the hunter, the emperor and the slave, the dictator and the revolutionary. Reading against the grain of mainstream histories, Neil Faulkner reveals that what happened in the past has never been predetermined. From antiquity to feudalism, and from fascism to our precarious political present, choices have always been numerous and complex, and the possible outcomes have ranged broadly between liberation and barbarism. Rejecting the top-down approach of conventional history, Faulkner contends that it is the mass action of ordinary people that drives the transformative events of our many histories. This is a history of power, abuse, and greed, but also one of liberation, progress, and solidarity. 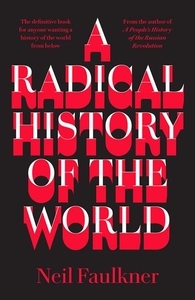 In our fraught political present--as we face the loss of civil liberties and environmental protections, the rise of ethnonationalism, and the looming threat of nuclear war--we need the perspective of these histories now more than ever. The lesson of A Radical History of the World is that, if we created our past, we can also create a better future.